Illustrations note XVIII, 348 p.
I: Introduction to Behavioral Assessment. 1. Background, Characteristics and History. 2. Current Status and Applications. 3. Functional Psychological Assessment and Clinical Judgment. 4. Goals. 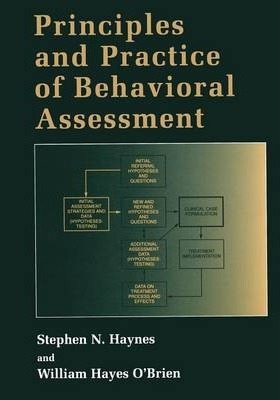 II: Conceptual and Methodological Foundations of Behavioral Assessment. 5. Scholarly, Hypothesis-Testing, and Time-Series Assessment Strategies. 6. Idiographic and Nomothetic Assessment. 7. Specificity of Variables. 8. Assumptions About the Nature of Behavior Problems. 9. Basic Concepts of Causation. 10. Models of Causality for Behavior Problems. 11. Psychometric Foundations of Behavioral Assessment. III: Observation and Inference. 12. Behavioral Observation: Principles and Methods. 13. Clinical Case Formulation.